Today in news that effectively means the end of Rush, drummer Neil Peart has announced that he considers himself to be retired. That comes from an interview Peart gave with Drumhead Magazine (via Jambase), and though he doesn’t seem to say “I am retired from drumming and Rush is pretty much done,” the implication of an anecdote he shares about his daughter introducing him as “my dad—he’s a retired drummer” is pretty clear. He also compares himself to athletes who eventually realize that “there comes a time to…take yourself out of the game,” and there’s really only one way to take that. 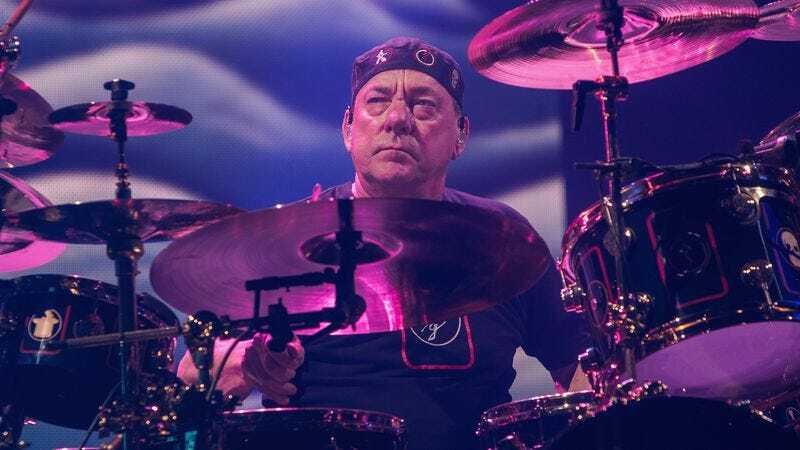 Consequence Of Sound notes that Peart suffers from chronic tendonitis, and his health and that of bandmate Alex Lifeson were contributing factors in Rush’s decision that the band’s recent R40 Tour would most likely be its final set of shows on that scale. However, Geddy Lee noted in an A.V. Club interview last week that he would “definitely” consider making another solo album, so this isn’t all bad news for Rush fans. It’s mostly bad news, sure, but at least there might be more music from Geddy Lee to look forward to.